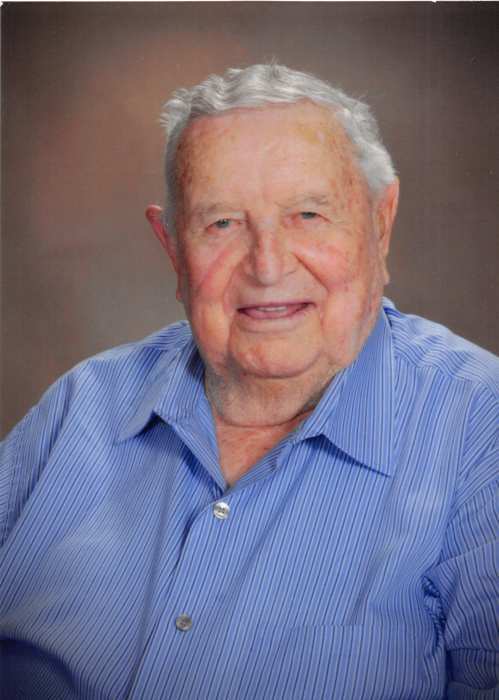 Emil Harold Geffert, 92, went to be with his Lord April 1, 2019. He was born July 18, 1926 to Henry and Clara Weise Geffert in Yorktown. St. Paul Lutheran Church was the site of his baptism Dec. 4, 1926 and his confirmation March 29, 1942. He married Allie Buendel Sept. 21, 1947. Following her death he married Bernice Buesing Warwas Sept. 7, 1991. Emil attended school in Yorktown and later served in the U. S. Army during World War II from 1944- 1946. For over 40 years he worked in the oilfield and then spent his retirement ranching and farming. He also owned Yorktown Casing Co. for many years. He was a member of St. Paul Lutheran Church, the American Legion, VFW, and the Masonic Lodge-Cameron Lodge #76. He is survived by his wife Bernice, blended family of daughters Shirley (Darryl) Mueller, Debbie (Steven) Kneese, and sons Larry (Martha) Geffert, Roger (Debbie) Geffert, and David (Donna) Warwas, and a sister Gertrude Gras of Victoria. Emil enjoyed his 14 grandchildren and 22 great-grandchildren. Emil was preceded in death by his parents, first wife Allie, sons Ray Geffert and Douglas Warwas, sisters Clara Koenig and Annie Gloor, brother Robert Geffert, 5 half sisters and brothers, and 5 step sisters and brothers. In Yorktown, visitation is set for Thursday 5-7 p.m. at Massey Funeral Home, and the funeral is Friday at 2 p.m. in St. Paul Lutheran Church with interment at Westside Cemetery. Pallbearers are grandsons Clinton Geffert, Cody Geffert, Jason Geffert, Ross Geffert, Jarred Karnei, Jeremy Kneese, Curtis Mueller, and Trent Warwas. Honorary pallbearers are granddaughters Heather Gisler, LeAnn Jander, Amanda Smith, Kristin Morris, Deanna Torres, and Lauren Rae Maxwell. Memorials may be given to St. Paul Lutheran Church or to any local charities of the donor’s choice.